Santa Fe Community College announces that nationally recognized rising political star Cindy Nava will address the 2017 graduating class at the college’s commencement ceremony at 2 p.m. Saturday, May 13 at the Pueblo Pavilion at Santa Fe Indian School, 1501 Cerrillos Road. The Graduation ceremony streams live beginning at 2 p.m. on YouTube. Read all about Graduation festivities, including the broadcast schedule for the ceremony on SFCTV-16 on Comcast. The Governing Board will hold a special meeting at 5 p.m. on Wednesday, May 10 in the Board Room. The agenda is available on the link below. For more details contact Donna Wells, ext. 1148. Forty-four graduates of SFCC Leadership Academy — along with family members, fellow employees and members of administration — came together Thursday to celebrate their completion of the nine-month professional development program. Photo: President Grissom with FEC Facilities Director Herman Garcia. OPIE reports that the grant application was successfully submitted April 24. It was one of the most collaborative grant application processes that SFCC has undergone. Margaret Peters, Vice President for Academic and Student Affairs, was honored with a Phi Theta Kappa (PTK) Distinguished College Administrator Award. This award is given to college vice presidents, deans or directors who have demonstrated a strong level of support for Phi Theta Kappa during their tenure. The award is given to only a handful of community college administrators each year. Congratulations, Margaret! Photo: Dr. Andrew Lovato (Associate Professor of Speech Communication and SFCC PTK coordinator) presented Margaret Peters with the Phi Theta Kappa Distinguished College Administrator Award. 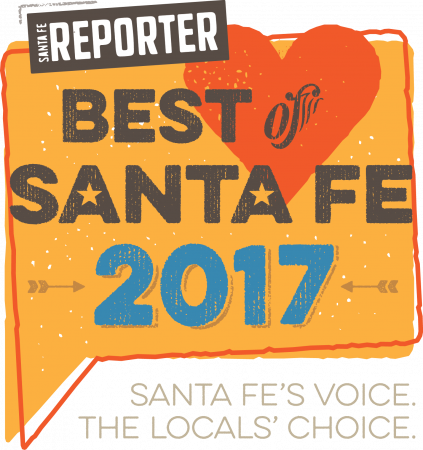 SFCC has been nominated for “Best Fitness Facility” in this year’s Santa Fe Reporter Best of Santa Fe readers’ poll. Final voting continues through May, so encourage people to vote! The scholarship application for City of Santa Fe/SFCC Foundation Veterans Scholarship is available. LANL Foundation is accepting applications for Regional College/Returning Student Scholarships. These $1,000 awards support nontraditional students pursuing two-year degrees and certifications. Applications may be submitted online by June 19 for July awards. New Mexico’s Children, Youth and Family Department (CYFD) Behavioral Health Services is offering a Day of Learning at SFCC, 8 a.m. to 5 p.m., Friday, May 19. The in-demand Mental Health First Aid Training is one of the available options. The training sessions are open to SFCC employees, students and community members. Registration is required. All students seeking support for endowed SFCC Foundation and institutional scholarships at SFCC must complete an online application, now available. Before enrolling, new students must complete an orientation packet and attend an orientation session 10 a.m. to 4 p.m., Friday, May 19. Classes begin May 30 in Spanish and English. For more information, call Adult Education at ext. 1356 or contact Lynne Matthes, ext. 1433. Those interested in applying to the Radiologic Technology program for fall 2017 can contact program director Mike Frain, ext. 1649, or program clinical coordinator Cheryl Peachey, ext. 1926 for advising. Applicants must take the TEAS V Admissions Test, offered May 26 at the Testing Center. Details at the Dental Health and Dental Assisting Program page. For more information contact Aamna Nayyar, ext. 1258. The SFCC Bookstore buyback of used textbooks runs 8:30 a.m. to 1 p.m. and 2 to 5:15 p.m. Wednesday and Thursday, May 10 and 11 and also from 8:30 a.m. to 1 p.m. and 2 to 4 p.m., Friday, May 12. For more information, contact the Bookstore at ext. 1218. Dog therapists will visit the Library from 11:30 a.m. to 1 p.m., Thursday, May 11 in the Library Instruction Room, Room 545. This great stress reliever is sponsored by SFCC Library and Animal Protection of New Mexico. The POMSS employee appreciation luncheon took place May 5. Thank you for everything you do for the students, college and community. We truly appreciate your hard work! View image. Join the Center for Diversity and Integrated Learning (CDIL) for a Trans and Gender Non-Conforming Support Group the second and fourth Wednesday each month from 7 to 8:30 p.m. at the Higher Education Center (HEC), 1950 Siringo Rd. For more information, contact Emily Stern, ext. 1467. Participate in a monthly karaoke night at SFCC from 5:30 to 8 p.m. on Thursday, May 11 in the Board Room. Students, employees and families are invited to attend and bring your own snacks. For more information contact Emily Stern, ext. 1467.